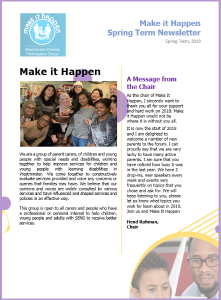 Make it Happen, also known as Westminster Parents Participation Group (WPPG), have launched their first ever newsletter to keep local parent carers of children with SEND up-to-date with the support available in Westminster. The newsletter will be released termly and will include local news, opportunities and a list of upcoming events related to SEND. To download the Spring Term 2019 edition of the newsletter, please click here. For more information on the other support offered by Make it Happen, including their weekly drop-in sessions, please visit their page on the Local Offer.